The battle for America’s entire communications future is playing out this week in two small towns in New Jersey. On May 9, the New Jersey Board of Public Utilities (BPU) is holding a hearing in Greenwich, a small town in Cumberland County in New Jersey. For years, residents and small businesses in Greenwich and another small town, Stow Creek, have had major service quality issues. Phone lines would go out not just for days, but for weeks. And when they worked, there was sometimes noise on the line. The town only has a smattering of available DSL service, poor wireless reception and no cable service. Yet under state law, known as Opportunity New Jersey, 100% of the state was supposed to have been upgraded by now, with the copper wiring of the Public Switched Telephone Networks replaced with fiber optic services capable of 45 Mbps in both directions. 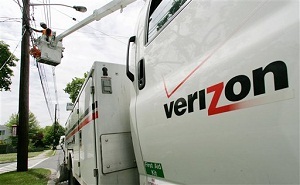 On March 12, the New Jersey Board of Public Utilities, with the help of Senator Jeff Van Drew, issued a ‘show cause’ order asking Verizon to explain why they failed to wire 100% of their territories with 45 mbps services, as they had promised. The underlying principal of Opportunity New Jersey is that these upgrades were "essential" to the economic growth of the state. Indeed, since that time there have been countless studies showing how high speed broadband and competition could drive the economies, and help the citizens of rural America. Phone companies including Verizon were able to exact more money -- lots more money -- in the form of higher phone charges and tax perks, to fund this upgrade. Verizon has responded, and responded to the show-cause order, claiming that it has fulfilled every obligation, that it has exceeded the plan -- with 100% of its "central offices" completed with "broadband". But in fact, Verizon now claims that any speed, including DSL, is really broadband -- even though DSL was considered inferior by Verizon in 1992. Also, Verizon claims 100% was always a goal, not a requirement. And Verizon claims to have lost 50% of their access lines as well as had financial losses since 2007, which "ballooned" in 2009. See the blow by blow of what Verizon wrote and we how we responded – and you can see just how the phone company can make commitments, then renege, and then claim that they’re actually the victim -- though, as we point out, they use half-truths or outright deception. The big question now is: What will the State of New Jersey actually do? Or more to the point, what will it not do? Some expect the utilities board to simply ask Verizon to make a few basic fixes for these two small towns -- and effectively give Verizon a pass on meeting all of it previous obligations pertaining to wireline service. Will the BPU actually do the right thing and hold the companies accountable? Or have these two towns been used as pawns so that Verizon can stop wireline services in the state -- and eventually the rest of the country? Not only have they not complied to provide an alternate to the two small towns mentioned, they have done the same in my town of Sea Bright NJ. Rates continue to climb in poor to moderate economic times, suppressing potential innovation.